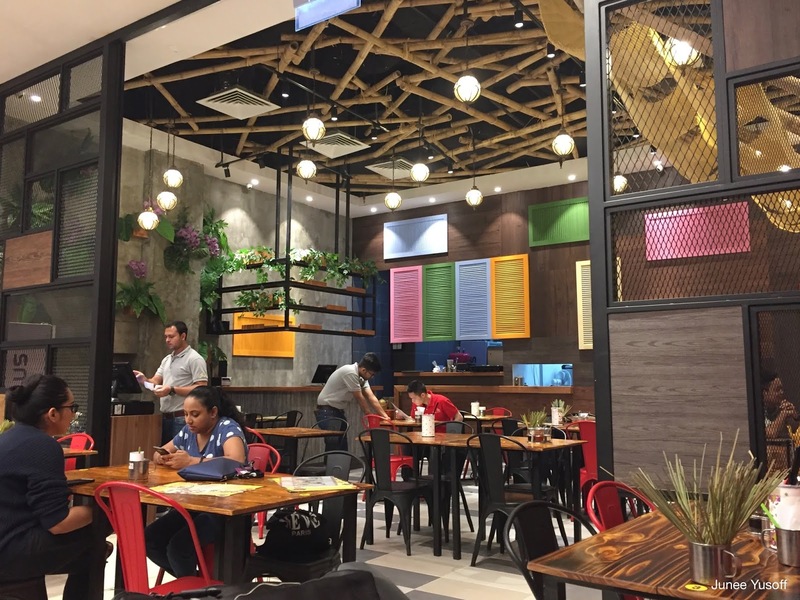 We currently live near Paradigm Mall, which has frequently become our haunting ground when it comes to food. As of late, Paradigm Mall seems to be undergoing renovation with new tenants and food vendors, which earns a much needed thumbs up from me! 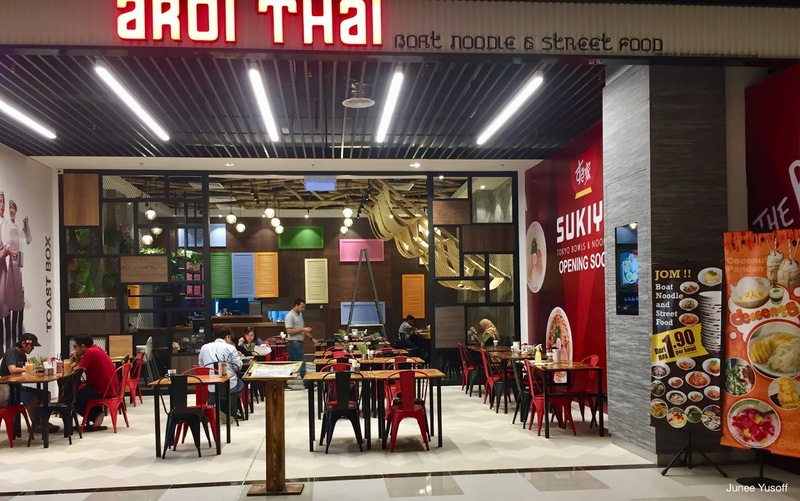 The latest F&B to join their family was AROI THAI, a Thai food joint. Store front. You can see the occupants to the left and right are opening soon. From the menu, you can see that the prices are very affordable. The Boat Noodle, Boat Selection and Street Selections are bite-sized and very affordable, at RM 1.90 each, and they also have the BIG Meal for regular portions. 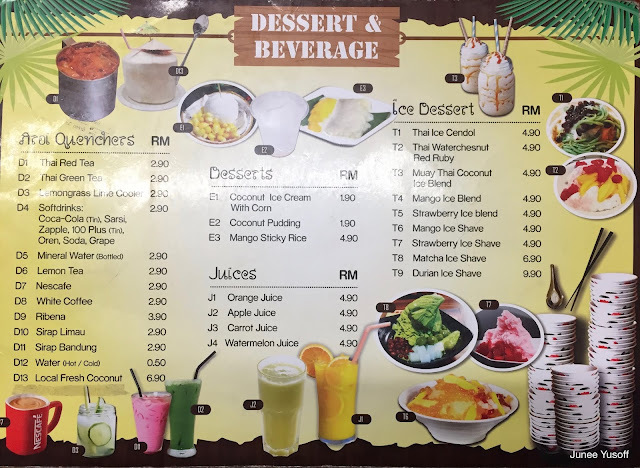 You can also opt for the Set Meal, which comes with a drink and dessert at a reasonable RM 13.90. The lunch crowd and interior is very clean. There are bamboo logs and kite-type fabric hanging from the ceiling for an authentic look and feel. They have also placed lemongrass stalks randomly on every other table for extra decor. 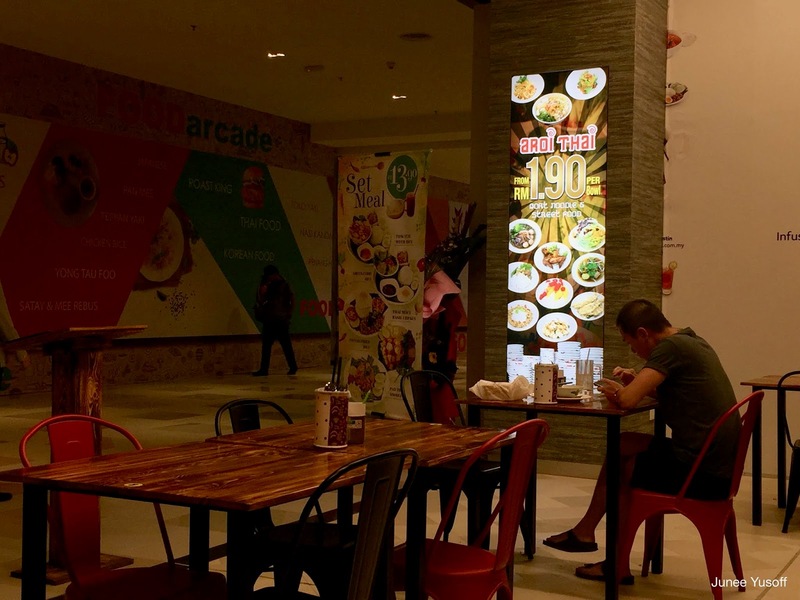 As the food court facing the restaurant has yet to open, there was a slight somber feeling. 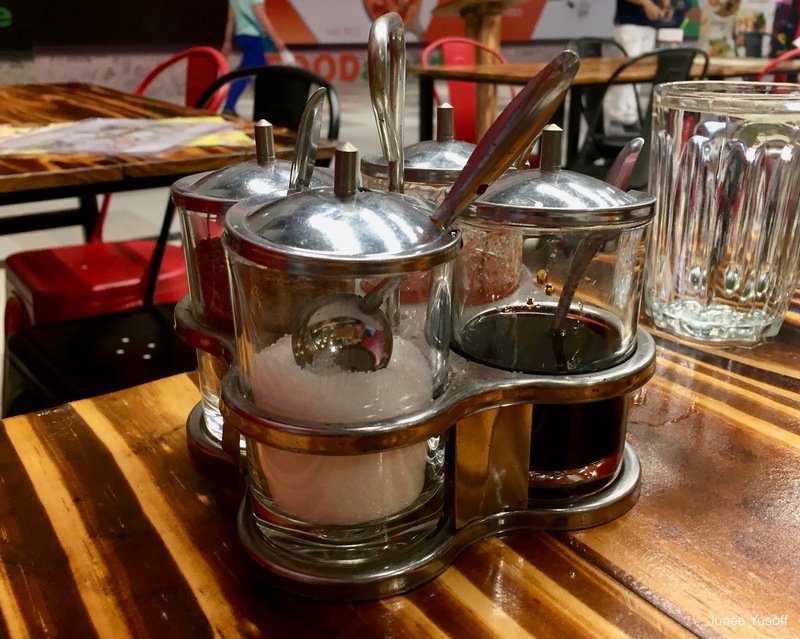 Condiments such as chili flakes, sugar, soya sauce (or fish sauce?) and chilli sauce to help zing up your meal! 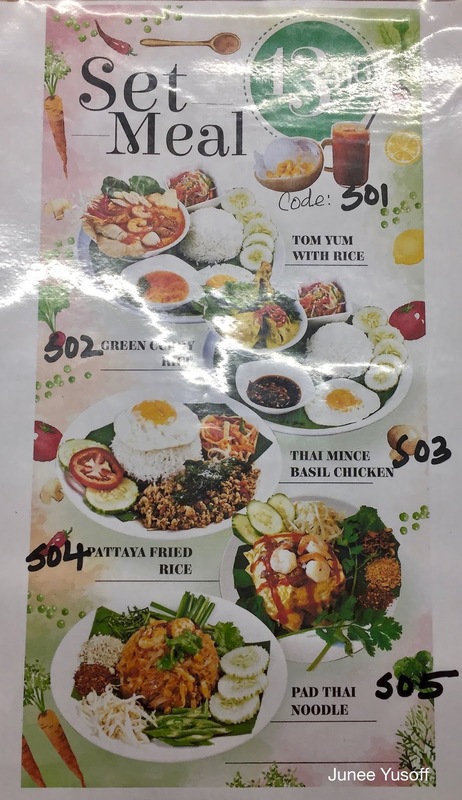 We ordered the bite-sized Boat Selection of Hot Basil Minced Chicken - Pad Kra Pow Kai - and Green Curry Chicken on Rice, each bowl for RM 1.90. To be honest the colour of the Green Curry didn't excite me - the colour was quite light. Tastewise, I had hope to be hit by a powerful spice kick, but it was quite mild in flavour. The Pad Kraw Pow Kai looks a bit more exciting in terms of colour. Tastewise it didn't taste as fresh as I had hoped; I barely taste the basil, but I felt a slightly fieriness of chilli. Pad Thai and Red chestnuts dessert. Traditionally, the jackfruit is served with this dessert, instead they had topped it with mango. They had also drizzled the dessert with rose syrup taste, so taste-wise the dessert had an unusual taste compared that we're used to. To me, the Pad Thai had the most flavorful taste out of all the dishes served. It had a vibrant taste based on a squeeze of lime juice, sweetness from the nuts and palm sugar, and a spicy kick thanks to the chilli flakes. There were crunchy elements thanks to the raw beansprouts. 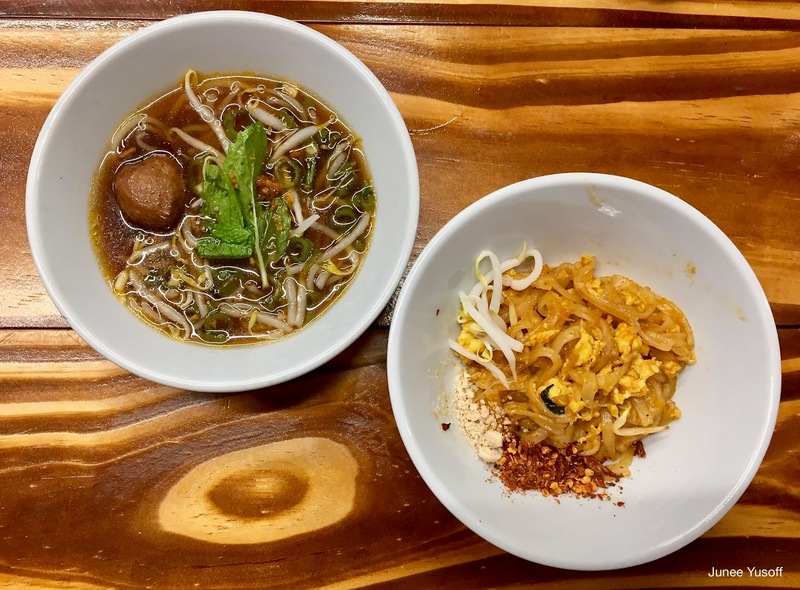 Beef Glass Noodle, which tasted almost the same as Boat Noodle franchise. 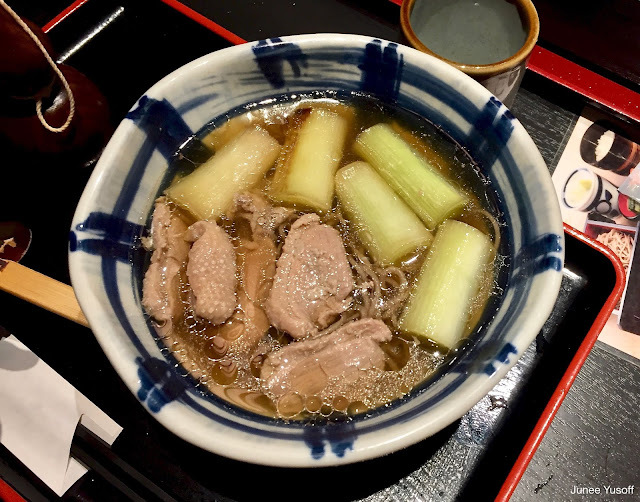 To me, the soup taste is generally not to my liking (it has a very strong and pungent beefy taste, and the stock is quite sweet). 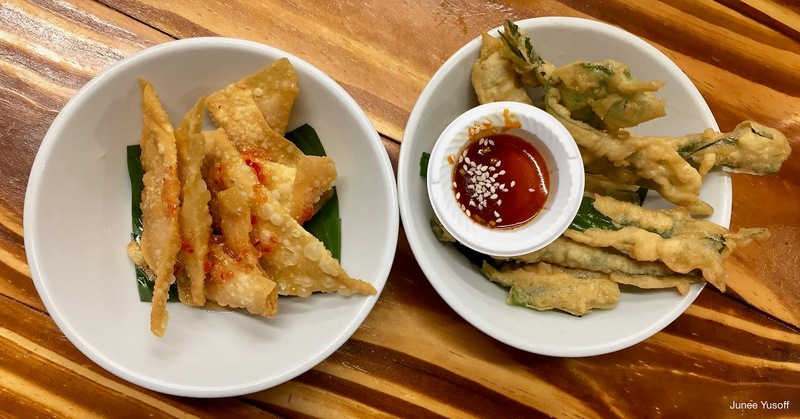 Crispy wanton skin and fried spinach leaves. Both were fried to golden crispy perfection, but I wished they had strained the fried items on kitchen towel, as the oil residue was still quite strong on the food. 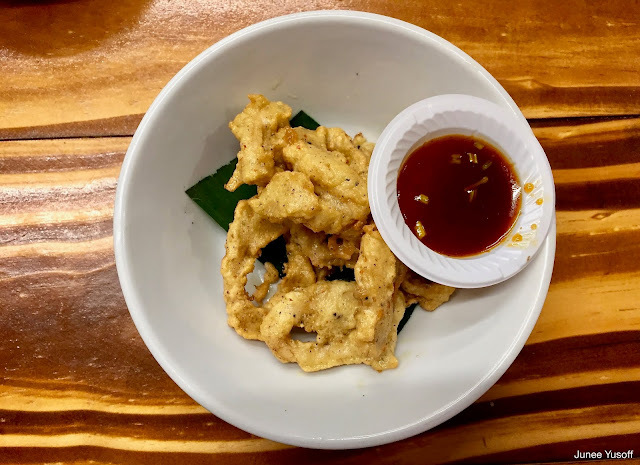 My Thai Fried Squid Ring special which they forgot about. The batter was quite thick. A disappointment. Definitely lots of options to choose from, from bite-sized, to regular plating, to noodles, rice dishes, or sides, with wide variety of drinks and dessert to choose from. 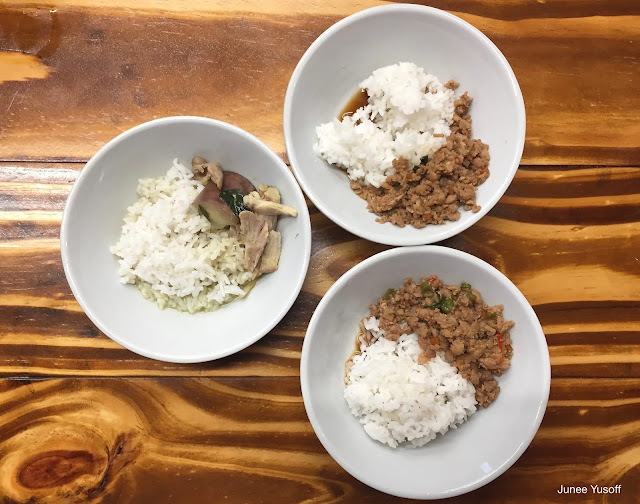 I was really disappointed with most of the dish tastes, which tastes watery, bland or imperfect texture. To me, the redeeming dish was the Pad Thai. Price-wise, even for a F&B the price is very low. The dishes are quite affordable. As a new restaurant, everything was definitely spotless. The only thing I noticed was that the menu seemed oddly battered, for a new establishment. Friendly staff, unfortunately they forgot my menu item, which they had even printed a copy of the receipt after we ordered. Love the vibe with the hanging bamboo logs. It's a shame the food quality was not up to far, however I do hope the taste factor was attributed due to the fact that it was just recently opened. 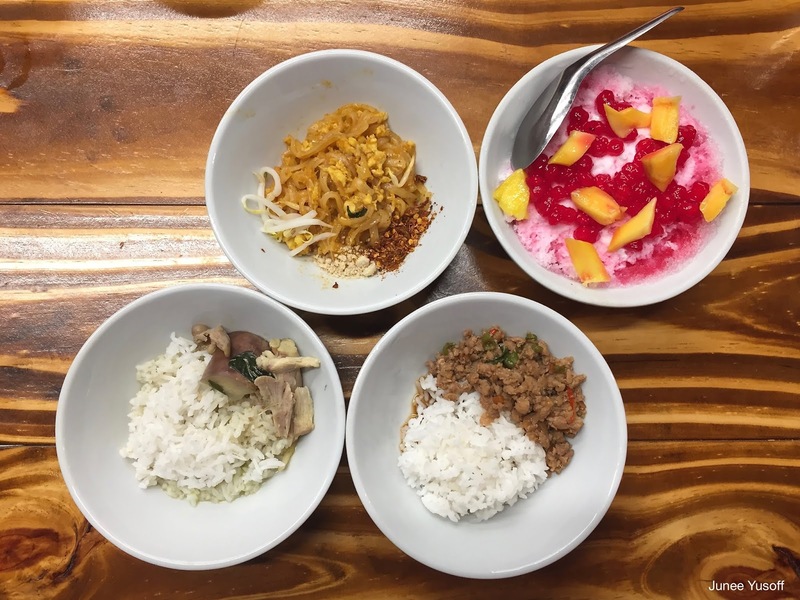 I would give it a bit more time and visit again to try other dishes, to see if there have been improvements. Watch this space! Originally, my husband intended to go to Japan for a business trip, on which me, our daughter, my mom and little brother tagged along with. 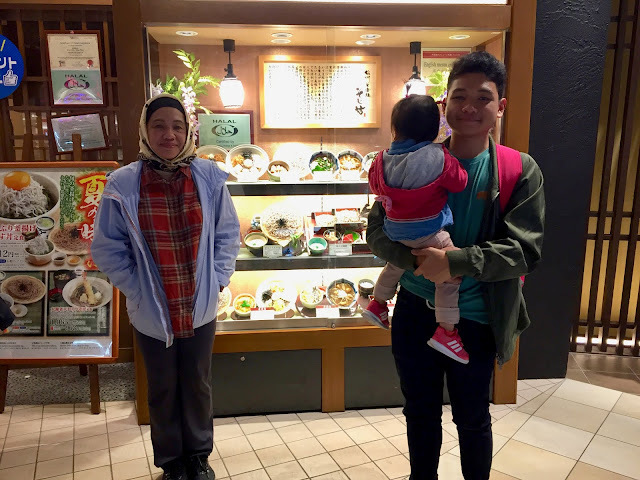 My mom had never been to Japan, and it was an opportune time for all of us to go. He had a brief meeting at Odaiba City, so we tagged along to see Odaiba Bay. 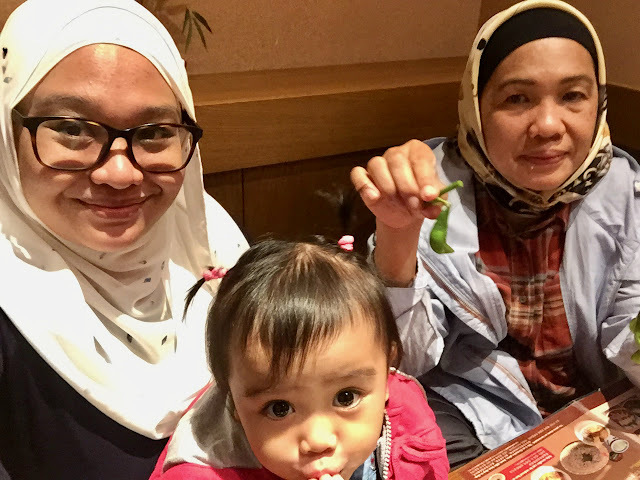 Post-meeting, we ended up at Sojibo Restaurant, a Halal-certified restaurant located at Odaiba City! I love their restaurant food displays, it looks so real! 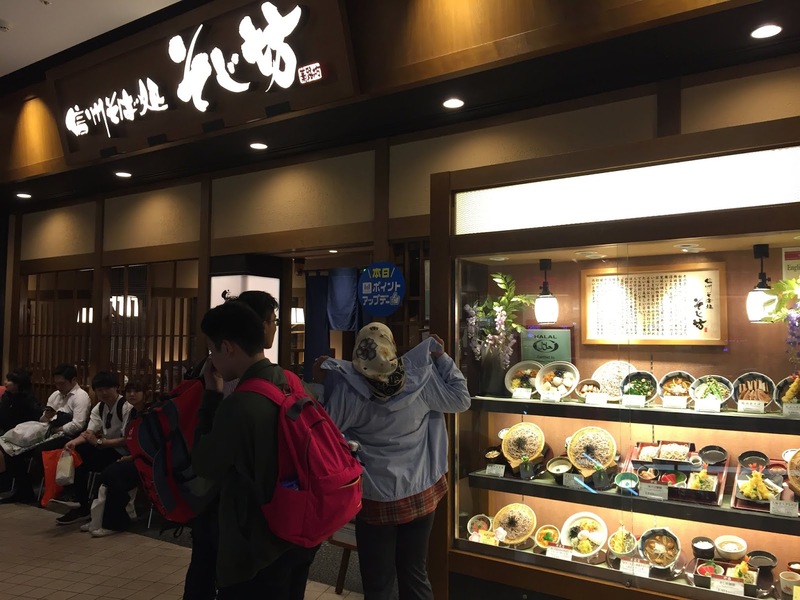 Upon entering the restaurant, we knew it would be a good meal as we saw many locals dining in. Menu illustration vs acual food, looks pretty accurate! 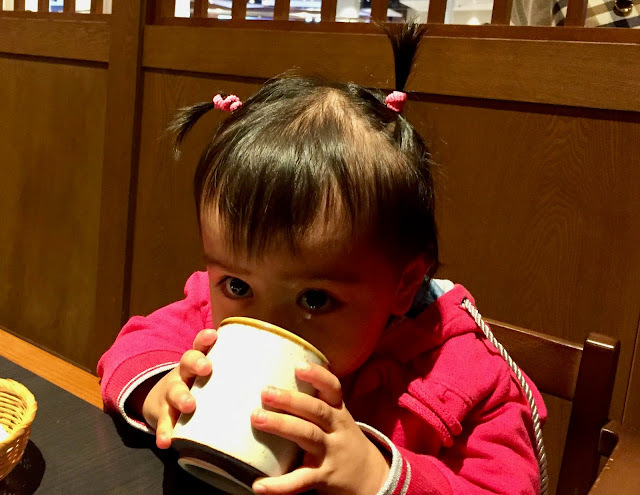 Imaan loved the green tea! She was also obsessed with the edamame. 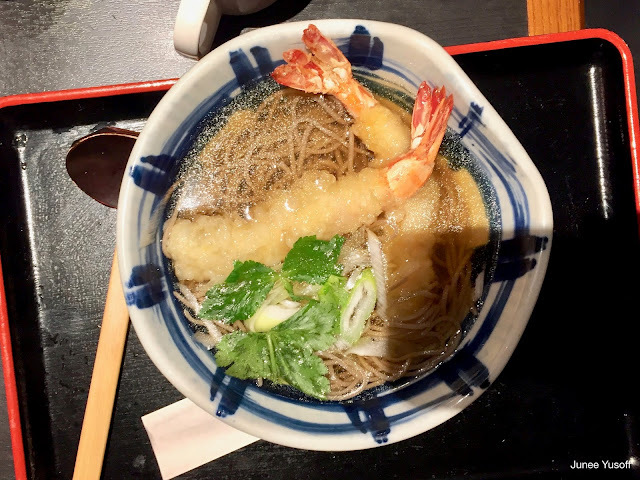 I opted for a simple prawn tempura udon. Unfortunately for presentation sake, when my tempura prawns arrived, the bottom half that was soaked in the broth ended up with a soggy batter. The one untouched by the broth had a promising glimmer of a golden and crispy batter. The broth itself was intense and rich, as it should be due to the simplicity of this dish. My mom opted for a duck ramen. The duck was incredibly tender, with a hint of smokiness. The leeks added a subtle sweetness to the dish, lifted by the broth. When this dish arrived, the aroma from the broth made your mouth water. 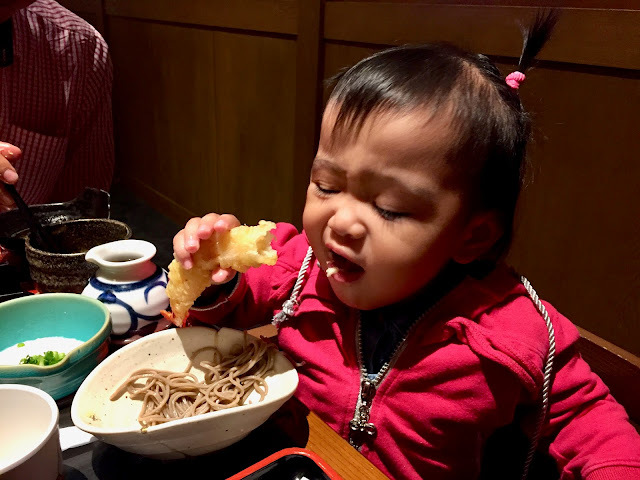 Imaan stole one of my prawn tempura. My mom and Rayan in front of the restaurant. 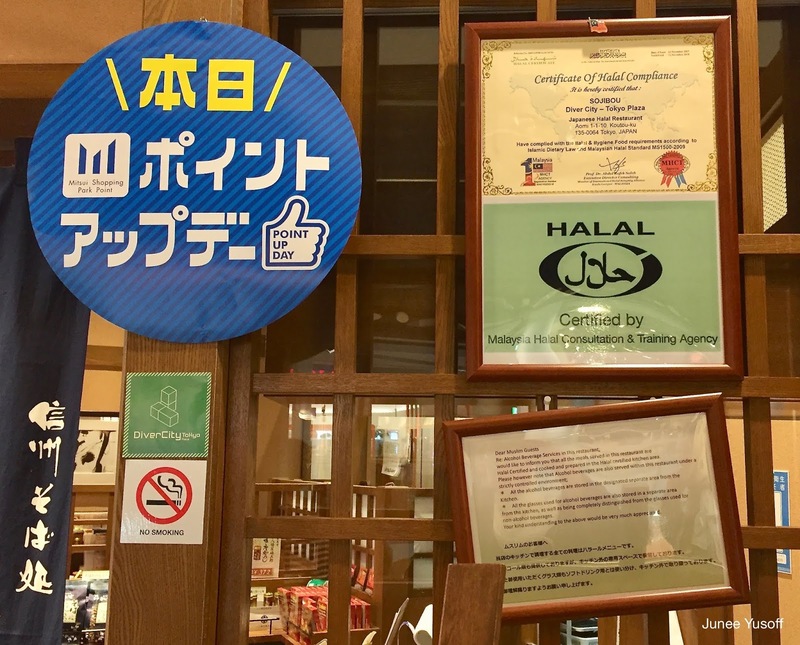 We actually had trouble spotting the restaurant, obviously as none of us can read Kanji; we only spotted it because of the Halal certificate. This was taken post-meal; you can see there are locals queueing waiting for dinner. Generally, Japanese restaurants are very attentive and careful when it comes to Halal concept; if they serve alcohol at the premise, they do mention it, and any alcohol, as well as the glasses used, are stored and prepared in a separate area from the kitchen, such as the note on the bottom right. It's a simple note, but this thoughtful gesture meant a lot to us. It seemed to me they went their extra length to ensure the Halal preparation was very thorough; many restaurants even prepared separate utensils to be used specifically only for Halal meals. 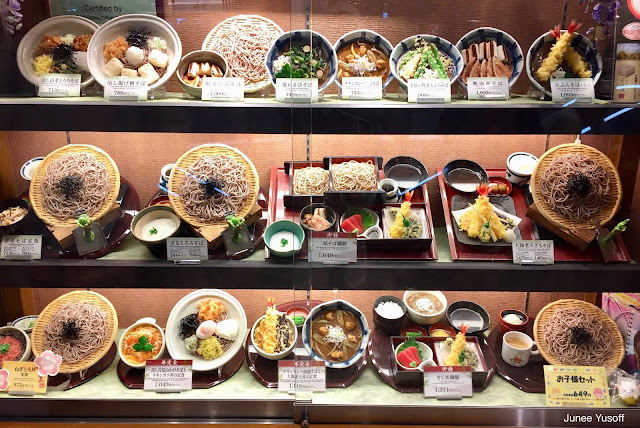 A lot of options, from rice to noodles to suit all taste. Really clean tastes that let the main ingredients to shine through. 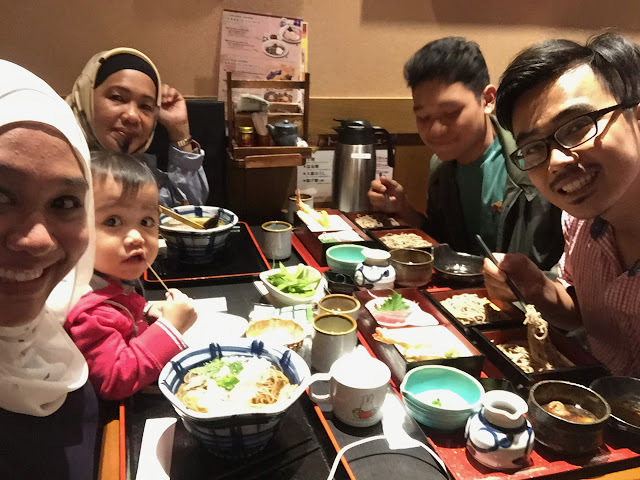 I do believe that Halal food is generally more expensive in Japan especially during dinner time, so expect a meal to be between RM 40 - RM 80. 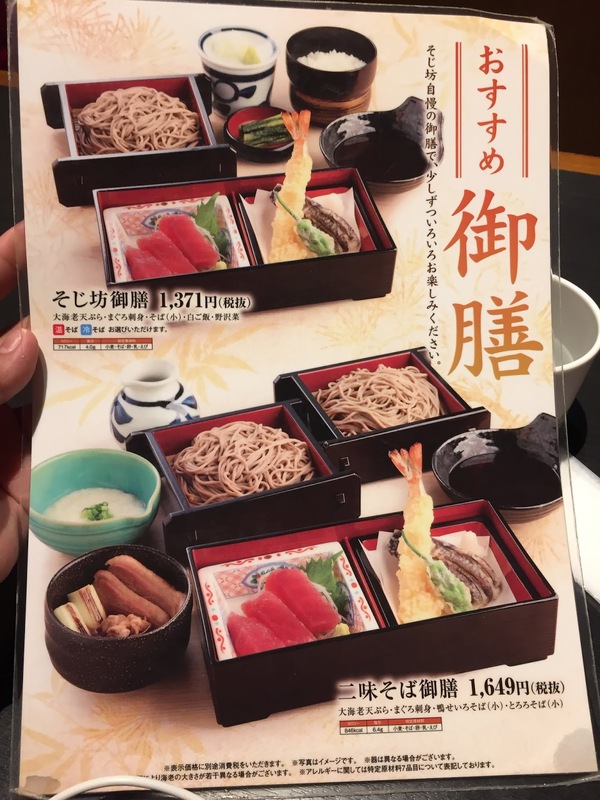 Some no-frills meals were as low as 800 Yen. 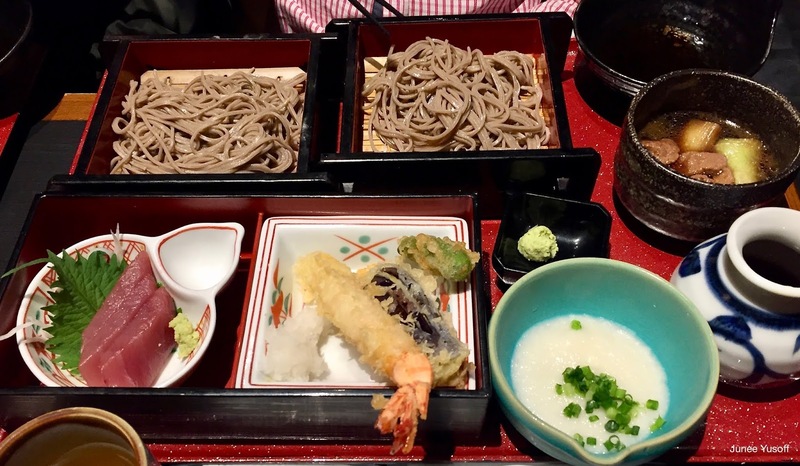 Most Japanese restaurants that we dined in was generally spotless. We were seated all the way at the back, so it was hard to get the waiter's attention. However, they were very sweet to Imaan. Cozy with dimmed lights, packed with diners but not overly noisy. A convenient and cosy spot for Muslims! You can definitely dine-in without was-was. Based on all the other restaurants, this was the only place that had a queue when we left, a positively good sign! Since I just hit my 30's, I have been trying to introduce more healthy food options for our family menu options. Simple ingredients, and simple methods appeal most to me. Less is better! 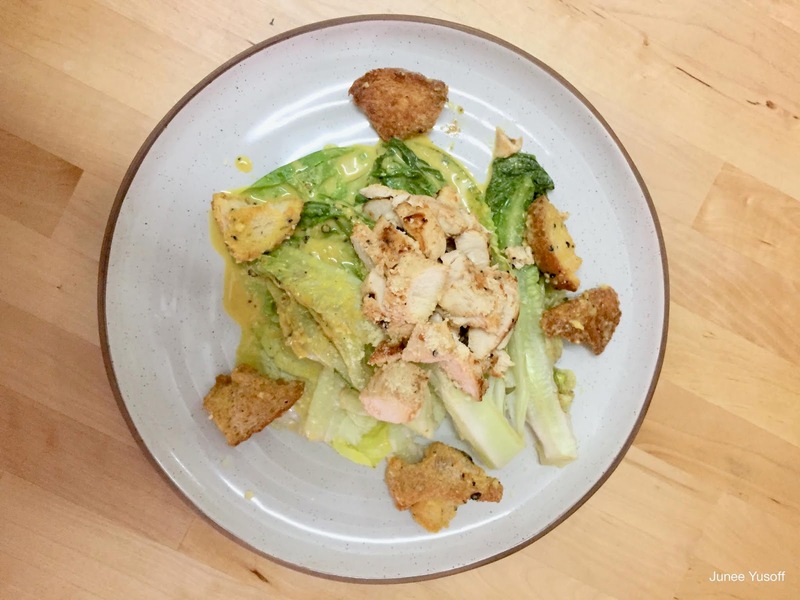 I got inspired watching Bon Appetit's Molly made a Caesar Salad. In case you didn't know, I had a bad experience with Caesar Salad a few years back, which caused me to spend almost a week in the loo, and ever since I have avoided the Caesar Salad at all cost. So the fact that Molly made a video which made me want to make the salad dressing says quite a lot! Anyway, the dressing was really zingy and good, and what made me happy was watching my husband enjoying the dressing as well! I modified the recipe slightly from Molly's original recipe. View The Ingredient & Method By Clicking This Link! Junee. 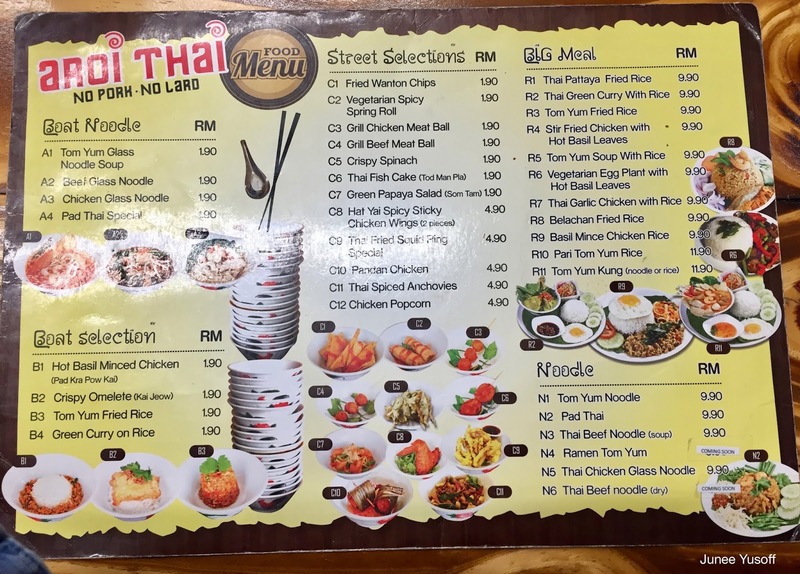 Based in Kuala Lumpur, Malaysia. 29 years old. A daughter, mother of a 1 year ++ girl and wife. I love to cook, travel, and drink coffee. Been blogging on and off but started seriously again in July 2017. 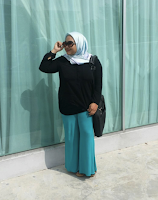 Founder of Socialistik, a Digital Media Company focusing on social media consultancy. I handle social media accounts and advertising for F&B, FMCG, retail and services company.